The Ironman North Carolina 70.3 triathlon was initially scheduled as my test race for Ironman Arizona the following month. 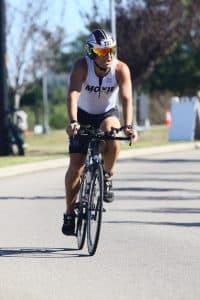 Unfortunately, my last two triathlon seasons have been plagued with obstacles that have taken just a little longer to overcome than expected. Instead, it became my triathlon season closer. Last year was a year of injuries, after being injury free for 8 years. This year I encountered an unknown virus that literally deleted my endurance for about 4 months. 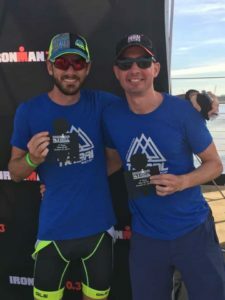 I trained hard, but I just wasn’t able to accomplish the long sessions needed to compete in a full Ironman distance triathlon. Luckily, the virus vacated just in time to allow that training to manifest for the Ironman North Carolina 70.3. How about I tell you about it? 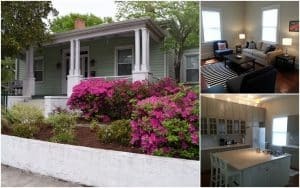 After a long, 10-hour drive, it was a treat to enter our rental home and find it had exceeded our expectations. It was an older home but well updated and extremely spacious. It comfortably fit the athletes, Jamie, Maria, Stephanie and myself, plus Maria’s husband Daniel and Chris our super-sherpa. The next surprise came as we walked to the Ironman North Carolina 70.3 expo and found the finish line was only three blocks away and it bordered a street that literally led right to our front door. Yeah, baby!! The Ironman North Carolina 70.3 expo felt even more sparse than the other 70.3 expositions I have participated in. It might have been because we walked in about 40 minutes prior to closing. This was something I was adamant about during the planning stage of the trip. I insisted that we try to arrive early enough to check-in on Thursday, so we would not be forced to wait in lines for either check-in or the Ironman merchandise store. That night was filled with good conversation, Mellow-Mushroom Pizza and a couple of adult beverages. Nothing that would hinder our race, but enough to ensure a good night’s sleep. Often enough, I insist and even put on my client’s training plans, that two nights prior to the race the objective is a good night’s sleep with no alarms the following morning. The intention is for the body to wake-up on its own signaling good recovery. The night before a race, sleep is still crucial, but the reality is anxiety usually precludes, not allowing the greatest of sleep cycles. The next morning, I was able to sleep in and awoke around 6:30 am. To my demise, there was no coffee in the house. As I was preparing a cup of tea, Stephanie awoke and coaxed me to the Brooklyn Cafe which was literally next door. As we opened the door to the smell of fresh baked goods and coffee overwhelmed our senses. An older couple was behind the counter, we later found out were the owners of this 2-month-old establishment. Even with the newness of the cafe, they knew what they were doing. We had two orders of fresh, made to order beignets and coffee which, to my surprise, rivaled Cafe DuMont in New Orleans. We watched one of the owners roll the dough, cut and drop the beignets into the fryer. He then served that fried deliciousness covered in powdered sugar. They were pure heaven. The coffee was fresh ground, organic, free trade and was rich and flavorful. It was so delicious, we bought a half-pound for the house. The plan for the day was to head over to the swim start and jump in the water for 15 minutes or so. Following the swim, we would ride around the area to make sure our bikes were in working order and drive some blood to our legs. Finally, we would head back to the house where we would run for a couple of miles to get our heart rates up for a short time and test the legs. It happened pretty much as planned. 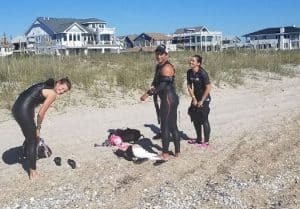 We were fortunate that a bunch of member’s of Stephanie’s coaching group, TriMarni, rented a house near the swim start, so we had a headquarters to park and store some gear. They had invited us to hang out there before the race the next day which we took advantage of. We were not allowed on the actual swim course so we decided to swim in the ocean. Upon entering the water I became excited as the density of the salt content, plus my wetsuit made my swim position and balance almost effortless. 800 meters later after returning to the house, we piloted our bikes refreshed. We spun around the area for about 20 minutes just to get the kinks out before heading back to run. Maria and I ended up being the only ones to run. She pushed the pace a bit faster than I wanted but I felt like I could take on the world. Upon finishing the run I told myself that if I felt like I did at that moment, the following day was going to be epic. After completing showers, packing and labeling our gear with the required stickers, we were on our way to T-1 to drop our bikes. The transition from swim-to-bike was about 6 miles from the house, and as it was later in the day, traffic was dense. What should have been a 10-minute ride, turned into almost an hour before we turned in the school parking lot next to transition. Usually, bike drop for a 70.3 is just that, dropping your bike and leaving. The next morning would entail setting up your area to optimize time in transition. 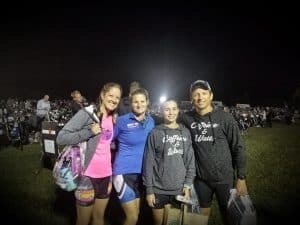 Ironman North Carolina 70.3 is a little different. Plastic bags are used to hold bike gear and placed on the bike. The only thing that can be done in the morning is the placement of nutrition. The gear was to stay in the bag until after the swim was completed. This procedure emulates more a full Ironman than a 70.3, but I understood why. We were instructed to not leave anything on the ground for fear of ants. That made sense. The others decided to just keep their bike bags and bring them in the morning. I left my helmet and shoes in my bag, tied to my bike so I only had to install my nutrition in the morning. The trip back downtown was not nearly as long, so Chris dropped us off and we walked to T-2 to drop our run bag. It was a little disconcerting that the dismount line was a quarter-mile away from the bike-to-run transition. We were going to have to run on a narrow, rubberized carpet over a rocky trail. We already saw, the quarter-mile run we need to take from swim exit to T-1. Obviously, we would have to plan on both transition times being longer than usual. Just another fun part of the sport. I had several conversations with other athletes during the weekend about how most races had their own equalizers to level the field. Ironman Augusta 70.3 has a downstream swim, but the bike is hilly which for a lot of age groupers would be a detriment. Ironman Chattanooga 70.3 also has a downstream swim but has a very hilly run. This race, Ironman North Carolina 70.3, would have a current assisted swim but longer distances within transitions. That night, I separated from my housemates to attend the Tribal Multisport dinner. An Uncle of one of our athletes, Michael, owned the South Beach Grill close to the T-1. The food was excellent and the company was better. The evening went incredibly smooth and faster than most group dinners I have attended. I think it was just shy of 90 minutes from the time we sat down to the click of the group photos being taken. South Beach Grill is another restaurant in the Wilmington area I would highly recommend. I arrived back at the house, double checked that my race kit, nutrition, race chip, swim cap, and goggles were ready to go, the coffee was ready to be brewed, and breakfast was prepared for the next morning. Two episodes of “Gotham” later, I fell into a fitful sleep. Exuberance filled me as I awoke on race day. Other race mornings I remember awaking anxious, or nervous, but today I was a little more calm than usual. I felt an extra confidence that I hadn’t felt in a while. My thoughts initially went to coffee and breakfast, but after fulfilling that objective, they migrated to visualizing the race. We arrived at T-1 at about 5:30 am and proceeded to set up our transition stations. Normally this would mean setting up towels, bike shoes and helmets, but we were told that would not be the protocol here. Basically, the only thing allowed was placing nutrition on our bike and bike shoes attached to the pedals if desired. Other than that everything else had to remain in the bag. I placed my bottles in their cages, and hung my bag from the aero bars, checked my tires, installed my computer and validated that my bike was in the desired gear. As I headed towards the exit to meet my housemates, I was excited to socialize with a couple of Moxie, Tribal, and Outspokin teammates. 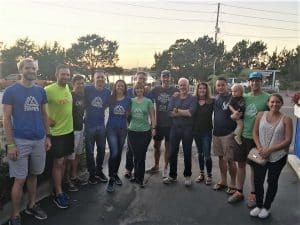 The social aspect of the triathlon community is one of the things I love about this sport. Yes, there is competition, but most of us are truly just racing against ourselves. We are just trying to be better than we were before. 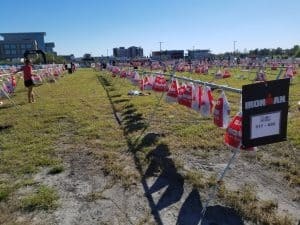 We passed through the waiting area at the swim start, that my friend Beth Shaw, who writes Discombulated Running, deemed the “Triathlete Refugee Camp”. I could see where she was coming from. Since the first wave didn’t start until 7:20 and it was only 6 am, most of the athletes were lying around or sitting on the asphalt chatting. My party headed to the TriMarni house which was a beautiful beach house. It was three stories, with ceramic tile throughout, beautiful countertops, and the best part, multiple bathrooms. Having a full-fledged bathroom to do your duty, prior to a race, is a special treat rather than a potentially disgusting portlet. Upon entering the house, the tension of race day filled the air. Everyone was milling around drinking either their own pre-race formula or coffee, nervously chatting, anticipating the upcoming moment to head back to the refugee camp. Around 7:00 we stepped onto the asphalt, gave each other hugs, said our “good lucks” and proceded with our own pre-race routines. I donned my wetsuit, dropped my sweatshirt, and flipflops in my morning bag, and placed it in a much larger bag marked with a range of bib numbers that included mine. Noticing all the other white swim caps lined up. I joined them and proceeded to move and stretch nervously. The waves moved together toward a crosswalk. A few minutes prior to the specified wave time, a crossing guard chauffeured us to the other side of the street. On the other side, we cautiously entered the water, via a slippery boat ramp and anxiously awaited the start horn. The announcer counted us down from 10, and we were off. The temperature of the water was 71 degrees Fahrenheit, but the air temp was in the upper 50s actually making me warmer. 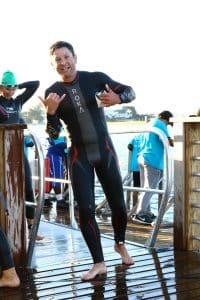 I allowed water to fill my wetsuit and compress to my body and waded close to the start. The horn blew and we were off. The plan for my race included taking the swim at a steady, aerobic pace. 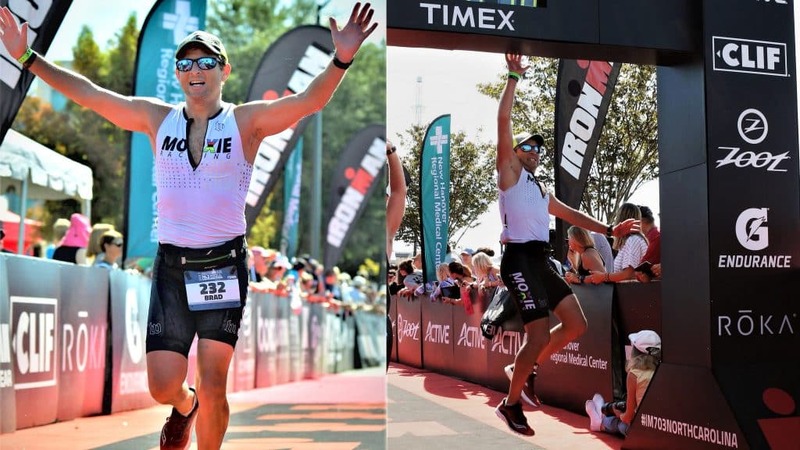 The swim event at Ironman North Carolina 70.3, has a strong current, assisting the athletes. As I have stated, many times, I am not a fast swimmer so I will take any help I can get. Swimming towards the buoys I could feel current, but as I gathered my line I didn’t notice it as much. My stroke felt the same as in the pool, and I was cognizant of my effort level, ensuring I didn’t overdo it. It took a good 300 meters, but I finally found a comfortable rhythm. My nerves settled and my mind calmed into race mode. That, was until I ended up in a swarm of swimmers all vying for clean water. Surprisingly as I was sighting I noticed the dark green caps of the previous wave. WHAT??? I had been focussing diligently on my swim, but I was usually enveloped by the wave behind me. I never caught anyone in the wave prior before. Holy crap! It was an amazing feeling. Out of the swim. I look pretty dope in my wetsuit right? Just as I was getting over my shock, I sighted on the next buoy and noticed it was moving. Yeah, it was being pushed out wider by a volunteer in a kayak. I literally yelled, “what the hell?” Finally, swimming around it, I found clear water and my relaxed rhythm again. I always tend to hug the buoys during a race. For me, it makes sighting easier and keeps me swimming pretty straight. However, I noticed most of the athletes found a line about 10 meters to my right. After climbing the ladder out of the river on my way to T-1, my eyes darted over and I noticed, the current was stronger more to the right of the buoys. I missed a major advantage, but it didn’t bother me too much as I still PR’d the swim. Glancing at my watch after clearing the ladder it read 31 minutes and change, however, I did not know where the timing mat was, so my official time was slightly slower. Wetsuit strippers were set up just a few yards from the exit of the swim, which made it easier to run the quarter mile to transition. I emptied the contents of my bag on the ground, and refilled it with my wetsuit, cap, and goggles, and donned my helmet and shoes. During my setup, I was in a quandary about wearing socks on the bike as I had worn them most of the time during training, but that morning, I decided I really wanted dry socks for the run without exchanging socks in T-2. Therefore, since I did have experience racing sockless, I slipped my feet into my shoes, grabbed my bike and rolled out of transition. From exiting the water to the mount line felt like forever and it showed in my time. Usually, the plan for my 70.3 distance races included holding a steady power of 185-195 watts. However, during the last two races, my run had suffered. This time I modified the plan to start at a steady 175 watts. I would then progressively increase my output to 185-190 watts, in the second half of the bike, depending on how I felt. My nutrition was simply a quarter of a bottle of Infinit, every 15 minutes and a Chia Humma gel or half Bonk Breaker every 45 minutes. This would fortify my body with 900 calories by the end of the bike. The swim would have been fueled by breakfast and a pre-workout Cliff Bar, so 450 calories would sustain me for the bike while another 450 would help to get my run started. 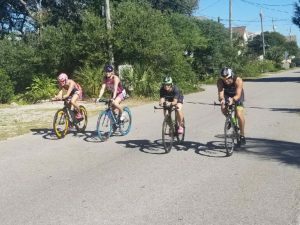 The first couple of miles of the course is around a residential area, so it was tough to keep my speed up, especially since I had some novice riders around me, but by the beginning of the third mile, it was on. The first half of the bike was reasonably flat and fast. I surprisingly found myself passing a lot of riders even at a low 175 watts. Speed is not a data point visible on the display of my Garmin Edge 520 bike computer. However, I do have a 5-mile auto-lap which briefly displays the lap time. With the exception of the first five miles, the display consistently read under 15:00 minutes every lap. Most of them were under 14 minutes. Obviously, 20 mph equates to 3 minutes per mile. Therefore every lap that read under 15 minutes meant I was faster than my previous race. It was tough to maintain my planned 175 watts knowing I had more in the tank and I could easily increase my speed. Deviating from my plan never worked out well in the past, so I hunkered down and stayed the course. Mile 30 came and went in a flash. I did increase my wattage a little on a couple of short hills, but other than that I was pretty consistent. That was until I ended up trapped in a peloton. It was maddening. I would slow down to allow the mandatory 6 bike lengths, and it felt like the whole group would slow. Surging forward I would create a good distance between myself and the rest of the athletes, hold my watts, but they would envelop me again. The question became how could I get out of this mess without, one, increasing my wattage to a point it would detriment my run, or, two, getting a penalty for blocking or drafting? At mile 45, I was so angry that, involuntarily, the words, “Screw this” came out of my mouth. I surged forward to a point where that group was no longer even visible behind me. That empowerment gave me so much confidence I maintained 190 watts to the mile 57 dismount line. Yes. The course was a mile long which was congruent with a lot of other athletes. After dismounting, I ran with my bike to the rubber carpet to enter the transition area as fast as possible. However, the one-lane chute was crowded. The polite athletes, like myself, shouted “on your left” sacrificing our feet on the jutting rocks. There is some recollection of other expressions in “MA” category, filtering through the air from others that were just as frustrated. Entering under the arch into transition I could see my bag hanging from the rack. Using a regular shoestring knot made it easy to drop the bag and spill the contents. I sat on the ground, rolled on my socks, put on my shoes, grabbed my sunglasses, hat, and race belt and ran the other 200 meters to the run-out arch. The last couple of 70.3 races entailed some pretty slow and miserable runs. That is if you can call them runs. They should have been more characterized as fast walks with a couple of miles of slow jogs thrown in. 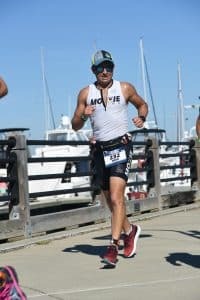 Ironman North Carolina 70.3 was going to be different and I didn’t care how much it hurt. I was going to run consistently the full half-marathon, but I would run it smart. The plan was to start a little slower for the first 3 miles. I would then either negative split or just remain consistent for the remainder. Brief recovery was included in the plan by briskly walking only through the aid stations. Since my plan started somewhat slow I prepared for the onslaught of athletes passing me at first. 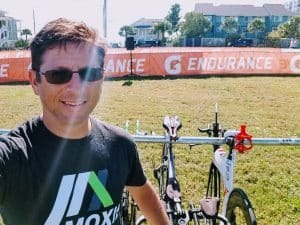 I learned a lesson early in my triathlon experience. Starting with a faster pace was a sure fire way for the run to be a sufferfest. The first mile felt slow but easy. There were no issues breathing and besides a tightness in my quads, which was normal, I felt really good. A sure fire sign that I should have a good run. At mile 2, our Super Sherpa, Chris, snapped some pics of me as he pedaled around on his mountain bike. I asked about the others and he assured me that everyone looked great. That news put a little spring in my step. The Ironman North Carolina 70.3 run course is out-and-back course. I could see the runners on my left running in the opposite direction. Obviously, during the first half, I would see them running to the finish line. Then running toward the turn-a-round during the second. Prior to mile 5, familiar colors and prance came into view. Nick Zivolich, screamed opposite me, in his Best Damn Race tri kit. We high fived yelling some motivation to each other. I was not surprised he was ahead of me, but somewhat frustrated realizing he started 15 minutes behind me. Not to mention he was almost an hour ahead of me. I cleared that out of my head quick. This was my race and I was going to complete my plan to the finish. Around mile 6, Maria sped by, followed by Stephanie a mile later. They both started 20 minutes ahead of me so I didn’t mind that at all. To pass the time, I figured out how far ahead they were and what it would take to catch them. I did end up figuring it out and if I were Meb Keflezighi or Patrick Lange it would be possible, but unfortunately not me. Well, not yet. My watch consistently ticked off 9:20-minute miles which were expected since the plan included walking through the aid stations. It did mean my actual running pace was under a 9-minute mile. Coming off a strong bike that excited me. section where the turnaround and timing mat was located. Entering this section is where I crossed with Jamie. She looked like she may be struggling a little, but strong enough to finish without too many complications. The idea of catching her ran through my head. I would start testing a faster pace to determine if that would be possible. As I was exiting the single track, Michael, one of my Tribal teammates, entered. Now Michael is fast. A 7 minute-mile runner for sure. Now I had two challenges, catch Jamie and keep Michael from passing me. If anything, the last 6 miles would be fun. Mile 8 came and went. Passing mile 11, the familiar Tribal cap with an audible, pat-on-the-back whizzed by. It was Michael. Truth-be-told, at the time I was feeling pretty proud holding him off that long. Mile 12 included a somewhat steep ascent back into downtown Wilmington. Glancing at my watch and saw my run time was 1:54. My hopes were for a sub-two hour run. Unfortunately, it just wasn’t in the cards this day, but I would come close. 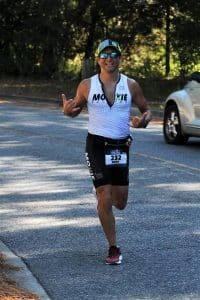 My traditional burst of speed came entering the Ironman North Carolina 70.3 finish chute. I leaped for a Moxie Dunk at the finish line as exhaustion washed over me. The knowledge that the time clock indicated a PR felt positively overwhelming. I accomplished what I came to do. I followed my plan and succeeded. 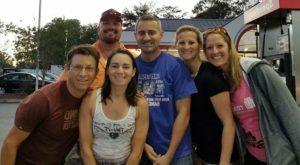 The 2017 Ironman North Carolina 70.3 event distances did not have to be modified. That being said, I could officially consider this my PR by over 10 minutes. Earlier in the year, I completed Ironman Chattanooga 70.3 in 5:25, However, the swim was cut short by 800 meters, so I refused to count it. The finish area displayed jubilantly tired athletes, vendors, and food tents. With a smile and skip in my step I found Tribal teammates, Joey, Michael, and Brian K. Everyone seemed as excited about their performances as I did. Joey and Nick both received 3rd place in their age group. Nick’s triumph grabbed him a spot to the 2018 World Championships in South Africa. Michael, Brian K. Stephanie and I all PR’d, so it was a great day for all of us. I am so proud of my friends, and teammates for what they accomplished. It is such an honor to be among them. Both my bike and morning bag were waiting for me at the bag check area and the volunteers were extremely efficient to procure them for me. A quick walk later I retrieved my bike and bag from T-2 and rode back to the house. The rest of my time consisted of Irish Car Bombs, a Phở lunch and a visiting some breweries around Wilmington. Wilmington is a beautiful area. I hope to return to race Ironman North Carolina 70.3 again in 2018. I will have to include a couple of extra days to hang out. Did I mention that hit shows, “Dawson’s Creek” and “One Tree Hill” and some major motion pictures were filmed in Wilmington? What was your best race or event of the year? I’ve never run a race like this, but this is amazing and super admirable!